Most dogs enjoy swimming and playing in the water. However, only a few public pools will welcome your pooch and let him have fun. Aside from that, the travel time to the pool can also stress your dog. Instead of enjoying the water, he will deal with motion sickness after the ride. Hence, consider investing a quality dog pool. Allowing your dog to swim can stimulate his mental health and build muscles in the process. There are lots of manufacturers that offer dog pools, but only a few can provide the one that is most suitable for your canine. To help you make the right decision, here are the top ten best-selling dog pools that can provide a quality water-bonding time with your buddy. From the largest to most durable dog puddle model, you’ll sure to find what you are looking for. 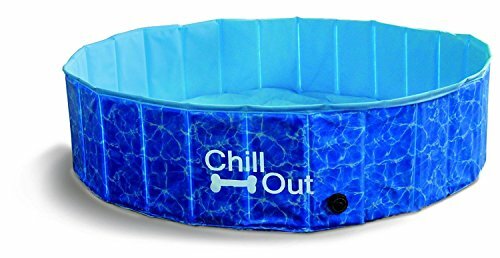 This blue bone-shaped dog pool from One Dog One Bone provides a water bonding time with your dog for many years to come. It’s made of heavy-duty truck bed liner material and can cater medium to large sized dogs. Even if your pooch loves chewing on things, especially plastic, rest assured that this model can withstand your dog’s teeth. It can hold up to 85 gallons of water, allowing your dog to stay cool and fresh during summer. The brass cap and drain will enable you to drain the pool without difficulty. It’s also resistant to the harsh UV rays of the sun, so there’s no need to worry if you’re planning to place it in your backyard. 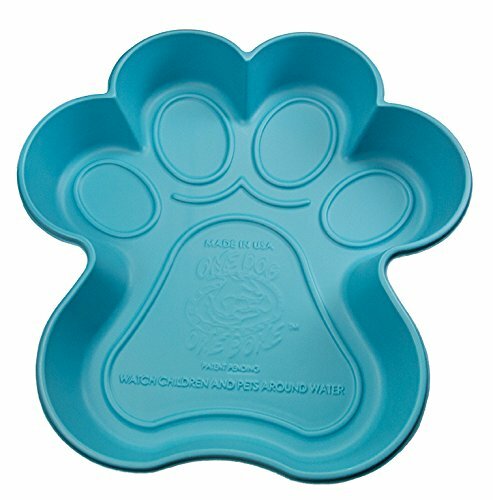 Another product from One Dog One Bone is this blue paw-shaped play pool for your canine. It’s made of heavy-duty truck bed liner material to resist the chewing and scratching of your dog. This model can contain up to 20 gallons of water. It flexes like a paw for easy draining. The materials are resistant to both chewing and harsh UV rays of the sun. 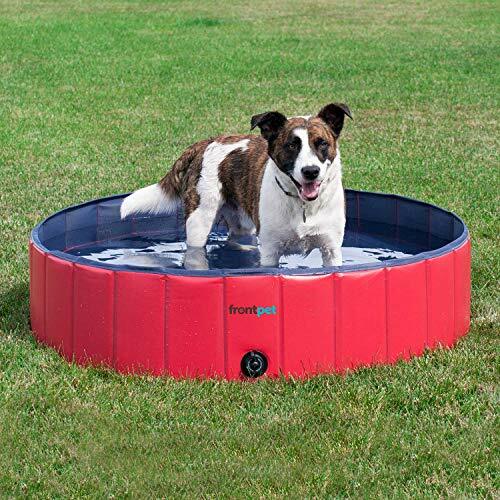 Thanks to this paw pool, you can maintain the temperature of your dog this summer. The water can stay for an average of 10 degrees Fahrenheit cooler because of its light color that enthralls lesser light and heat from the sun. From now on, you don’t need to buy cheap kiddie pools for your dog anymore. If you love traveling with your dog, check out this collapsible dog bathing tub from Dan. It is made of safe and quality PVC waterproof cloth. The corners are sealed to prevent water leaks. There are drainage holes on the side for easy cleaning and drainage. Best of all, this model is collapsible and foldable. When not in use, you can store it and secure it inside the house. It also works well for traveling or camping with your dog. It can serve as both pet swimming bath pool and an outdoor water pond. 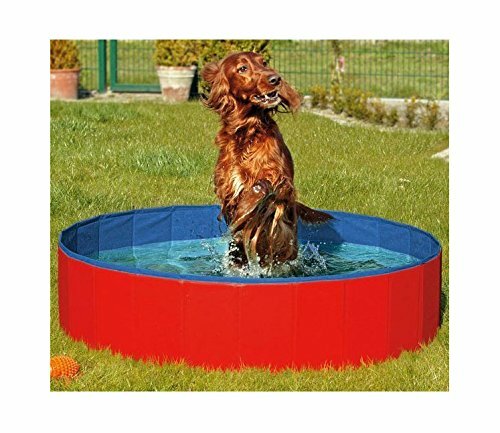 You can train your dog how to swim with this multipurpose dog pool. It’s easy to set up and no need for inflation. You don’t need to burn a hole in your pocket to keep your pets stay cool this summer. Its generous size can fit medium to large dogs. Check out this refreshing pet pool from All For Paws. It’s a great puddle to keep the temperature of your dog down during hot summer days. This model is made of high-quality and eco-friendly materials. It’s 100% non-toxic for animals and safe for puppies to use. For pet parents who do not have the luxury of space in their house, this is an economical choice. You can fold it up and store it inside the house when not in use. This pool can be used for traveling and camping with pets. For the safety of your pets, this model has an anti-slip base. Rest assured that they are safe playing in the water even if you place this dog pool on the patio. 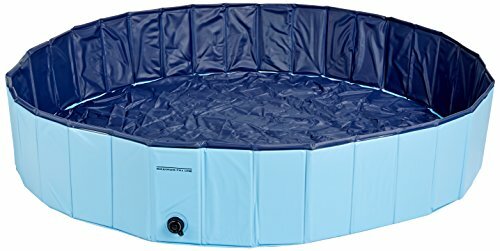 This medium-sized blue dog pool can accommodate large dogs at a time. Now you can wash and play with your dog in the waters without breaking your bank. The first thing you’re going to notice in this model is its large size. 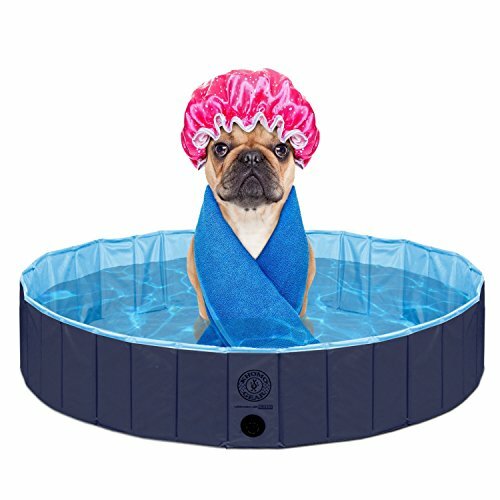 Perfect for bear-like canines, this foldable blue dog pool from Cool Pup is one of the hottest trends in the marketplace. Now you can provide a great place to play with your pooch thanks to this easy-to-use dog puddle. The convenient design of the model allows you to store and secure it when not in use. It is made to last thanks to its extra-tough PVC; there’s no need to worry even if your dog loves chewing things. You can fill the tub with ease and drain it after use. It does not consume much space in the garage because of its collapsible design. This dog pool comes in three sizes; the largest can hold up to 119.25 gallons of water. This is an ideal option if you want to teach your dog how to swim before introducing him to deeper pools. 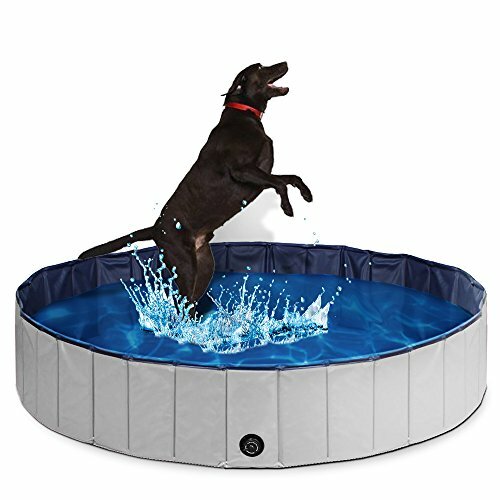 For pet parents who want to spoil their smaller canines, check out this outdoor swimming pool from Kopeks. Bathing your dog has never been easier with this dog pool. Its extra-large dimension allows your dog to sit and turn comfortably without hitting the sides. The pool is easy to use, there is no need for inflation. All you need to do is fill it with water and enjoy bathing time with your buddy. Draining the pool is a lot easier thanks to its easy to twist-off cap. Just leave the pool in a few minutes, let it dry, and you can store it securely in your garage. The heavy-duty and durable material can resist chews and scratches of your dog. Its high-grade industrial-strength PVC is built to last a long time. It includes a plastic carry allowing you to bring it anywhere you want to play with your dog. 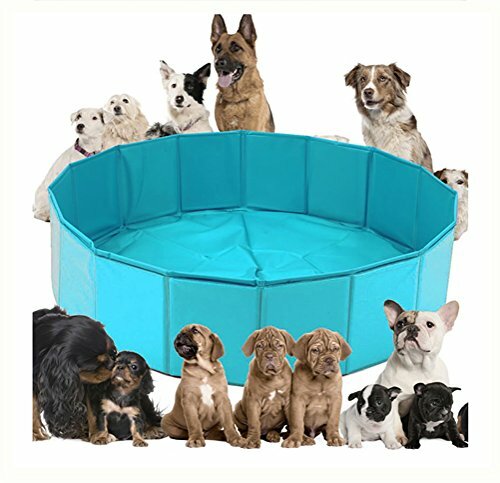 Now if you’re looking for an extra-large size dog pool for your bear-like canines, check out this foldable Pupteck dog pool. It can accommodate several puppies playing together in the water. 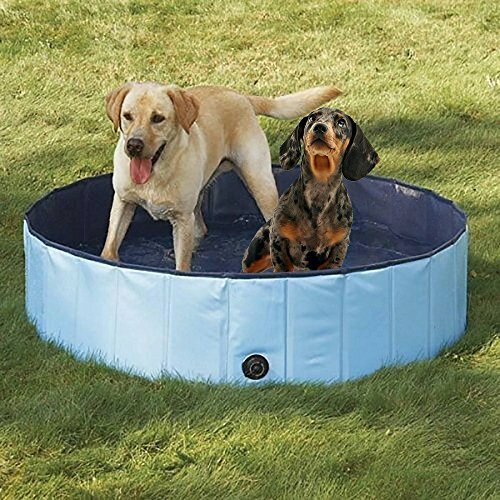 You don’t need to burn a hole in your pocket to provide a spacious dog pool for your canine. Thanks to its collapsible design, you can fold and secure the dog pool when warmer days are over. It’s also an excellent choice for bathing energetic dogs who loves turning around in the water. This model comes with a storage bag to maximize the investment. It is made of extra-tough PVC material to withstand your dog’s constant bickering and scratching. For your canine’s safety, it has a thick slip-resistant material on the bottom. It also prevents the pool from water leaks. Keep your pets cool and fresh during summer with this practical bet bathtub from Petfly. It offers a wide range of application—be it a fish pond, baby bath, dog bath, or outdoor pet pool, you name it! This eco-friendly pool is made of adopting PVC material. It’s 100% safe for pets and reusable. The smart design of this model allows you to have a hassle-free set-up. Within minutes, you can let your dogs play in the water. The pool comes in two large sizes of your choice. There is an easy-to-twist cap mounted on the side for easy drainage. When not in use, this collapsible pet bathtub can take place in your garage’s cabinets. Now your large canines can be fully saturated thanks to its generous size. Can’t get enough of collapsible outdoor pet tubs? Check out this model from FrontPet. This large pool is suitable for your large dogs. Constructed from extra-tough PVC material, this pool is made to last. Similar to other collapsible dog pools we’ve reviewed, it’s easy to use. Fill it with water and open the sealed drain when your dog is done playing, or the water is getting dirty. After that, fold the pool for storage or transportation. Now you can keep your dog busy this summer playing in the water. It can serve as both pet bathing tub and an outdoor pool. Its durable material can withstand your dog’s nails, so there’s no need to worry about wear and tear even if your pups are running around inside. Allow your furry friend to enjoy this summer with this all-new foldable dog bathtub from FurryFriends. No inflation or deflation required when setting up the product. It’s portable and easy to store. The high-grade material design allows your dog to play all day without getting tore. Thanks to its generous size, even large dogs can get completely soaked in the water. This model can serve as both an outdoor pool and dog bath tub. You don’t need to bring your dog to the public pool to stay cool on warm days. Just set it up and leave them all day to play in the water. In a reasonable price, you can experience its best value and product quality.